So it’s finals weekend at Wimbledon and once again the country has gone slightly mad over a pale, sweaty man whose nationality is decided for the year at roughly six o’clock on Sunday evening, British for a win, Scottish for a loss. As a lover of most sports, I am highly aware that for some reason these activities that cause so much excitement and suspense in real life rarely ever translate successfully to the big screen (2004’s god awful Wimbledon can be cited as a timely example of this). Here are ten sporting films that, on a personal level at least, capture something of the enjoyment one can feel watching the real thing. The first of a few mentions for baseball on this list, A League Of Their Own details the real life story of the women’s baseball movement and surge in popularity during World War II. A stellar cast of female stars including Geena Davis, Madonna and Rosie O’Donnell combined with montage after montage of home running, base sliding, strike out action prove to be a big hit (pun absolutely intended). Shut your eyes for a second and try to imagine a football team comprising Michael Caine, Sylvester Stallone, Bobby Moore, Ossie Ardiles and Pele. 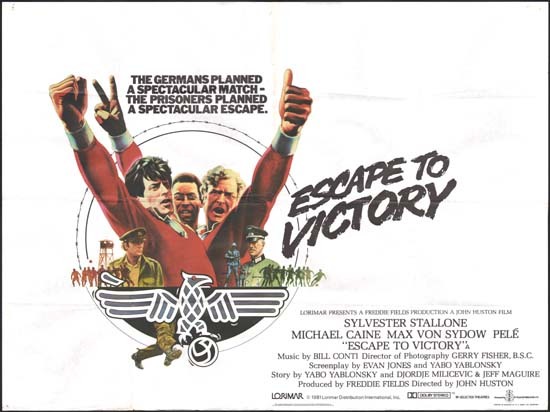 Oh wait, you don’t have to because it flippin’ happens in Escape To Victory, an absolute footballing classic and must watch for anybody with a pechant for slow motion shots of outrageous goals. Also, any opportunity for a film that shows those pesky Nazis what for is greatly received. 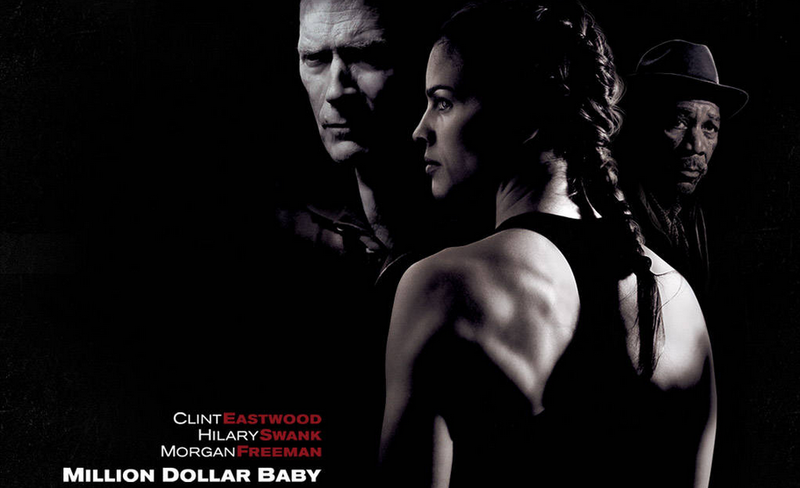 Probably the grittiest entry on the list, Million Dollar Baby depicts the tragic tale of female boxer Maggie Fitzgerald and her rise and unfortunate fall. Perhaps the most critically acclaimed film included, winning Oscars aplenty in 2004 including Best Actress for Hilary Swank, Best Supporting Actor for Morgan Freeman and Best Picture and Director for Clint Eastwood. All the awards! Depicting perhaps the most niche sport represented on the list, Drew Barrymore’s directorial debut effort Whip It introduces us to the weird and wonderful world of roller derby. Starring Ellen Page as Ellen Page (as usual), we are treated to snappy dialogue, a killer soundtrack and most importantly copious amounts of scary but slightly alluring women smashing each other in the face speeding around a track covered in sweat and, at times, blood. Good stuff. Our second shout out to baseball, but this time think Ghost meets For The Love Of The Game. Kevin Costner plays farmer Ray Kinsella who hears voices in the corn fields and subsequently builds the baseball diamond we all secretly want in our own gardens. Much supernatural tomfoolery commences and we are treated to one of the most heartwarming films of the eighties, with one of the most memorable taglines. “If you build it, he will come”. 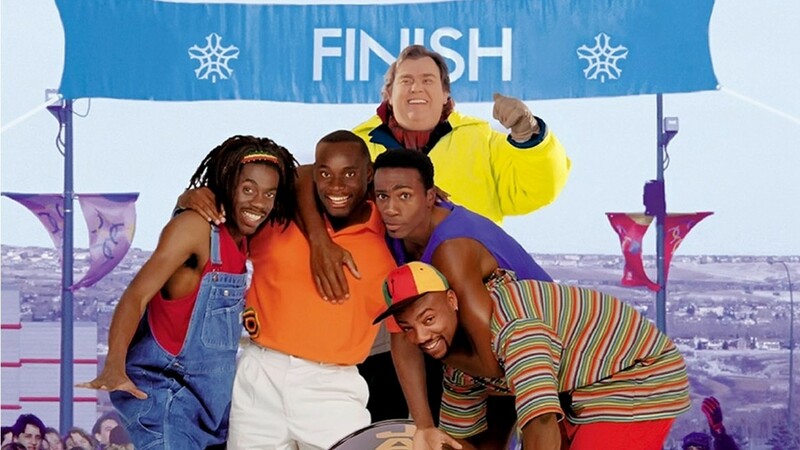 Utter the words ‘Jamaican bobsled team’ to me and I am instantly transported on a wave of childhood nostalgia back the early nineties when, quite frankly, the only sport I cared about involved a group of men with questionable experience hurling themselves down an icy track in a small metal tube. Based incredibly loosely on the exploits of the real Jamaican team at the 1988 Winter Olympics, it remains a firm nineties favourite. “Sanka, you dead?”, “yeah man”. If musically enhanced training montages are your thing then look no further than this 1976 Sly Stallone classic. The franchise arguably lost its integrity over the years and fell victim to the Hollywood sequel churning money machine, resulting in 2006’s horrific offering Rocky Balboa. If you only remember the series for its later offerings then it is more than worth going back to the original and being pleasantly surprised. I’m not ashamed to say that if I were to compile a list of my favourite twenty or so films of all time, White Men Can’t Jump would be there or there abouts. Starring Wesley Snipes and Woody Harrelson as a couple of street basketball hustlers, the movie provides the perfect balance of comedy, drama and genuinely impressive sporting skill. Also notable for perhaps the best usage of the word ‘quince’ in any film. That’s right, you guessed it, we’re back to baseball. However, this is one for the real sports fans among us. Less of the slow motion montage and much, much more of the statistics and strategy that can produce a winning team. Following in what seems to be a trend in sports themed cinema by being based on true events, Brad Pitt and Jonah Hill combine brilliantly to depict the success of the Oakland Athletics circa 2002, and their ground breaking approach of enlisting players through analysing data rather than gunning for the big names to sell replica jerseys. It’s a slow burner but incredibly satisfying. Don’t snigger, you know you love it. Scoring an outrageously low 35% on Rotten Tomatoes, Space Jam seems to be the undervalued and underscored gem of the nineties. It may have only appealed to a certain age demographic, but that was exactly what it was supposed to do, and if you’re telling me that you didn’t want to pull on a pair of Jordans and line up next to Bugs Bunny and the big man Michael himself, then you’re a down right dirty liar. Space Jam 4 lyfe, yo. Chariots of fire? Blades of Glory? The Damned United? Caddyshack? Happy Gilmore? Invictus? The Wrestler? Jerry Maguire? Dodgeball: a true underdog story? Come on man!